Barack Obama and the case of the missing Nintendo DS(es). A completely captivating story about the president-elect and his first family on the eve of his historic inauguration. Intrigue! Mistyque! Secret service agents “as big as boulders”! Missing Nintendo DS(es)! Leapfrog! Iraqi policy debate! Not only is the story entirely charming, but anyone with kids (or who has spent any time with kids) tasked with hunting down missing items can relate… well played, sir. does it come like dat or is it da skin hpm!? DSi XL is soooooooooooooooooooooooooooooooooooooooooooooooooooooooooooooooooooooooooooooooooooooooooooooooooooooooooooooooooooooooooooooooooooooooooooooooooooooooooooooooooooooooooooooooooooooooooooooooooooooooooooooooooooooooooooooooooooooooooooooooooooooooooooooooooooooooooooooooooooooooooooooooooooooooooooooooooooooooooooooooooooo much mor muny than a wii on eBAY. Barack Obama looks good on this Nintendo. 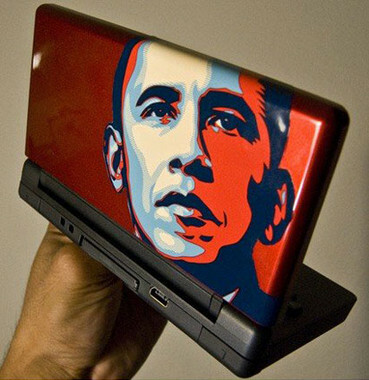 I think this is special edition Nintendo DS which has Barack Obama photo on it. This red color Nintendo DS is looks very good. I think nintendo should make theirÂ handheldÂ more customize-able Â that way I would have more fun with it. Nintendo always comes with best background.. My colleague had brought this console. It was looking cool and Barak obama also looking good on Nintendo.